The development of a new meter driver for SiDiary can be done pretty fast due to the long experience and the huge development framework from SINOVO. We will need some test devices from you (see checklist for details), a few test strips, the original meter cable, if required the Windows System driver and of course the specification how to communicate with the device. We have two models for such driver developments. 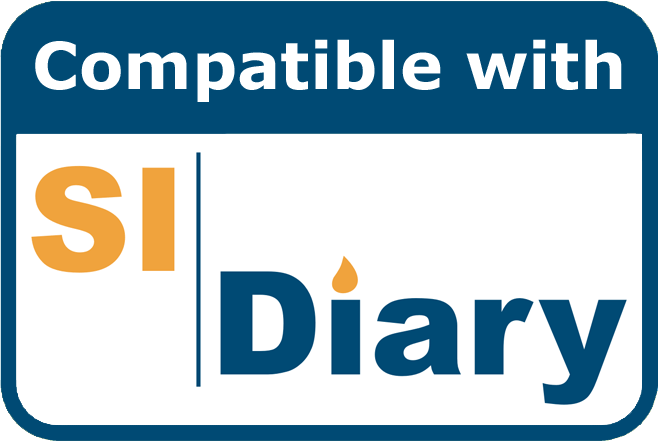 If you place our 'Compatible with SiDiary' Logo to your website and accompanying information like product flyers, catalogues etc. we'll develop the driver without charging you. Please allow some flexibility regarding the timeline because this cost-free development will be done between the development cycles of our own products. This option applies to all standard devices with an average development effort, which will be checked with your communication specification. In case that the communication with your device is complex due to the amount of data that it can provide (insulin pumps, devices with a complete logbook functionality etc.) or if you are bound to a straight going live timeline, please talk to us: We will prepare an individual proposal regarding costs and an agreed timeline. Before releasing a new driver officially, SINOVO will complete internal quality tests with your devices and we provide complete testing documentation of these tests together with a pre-release driver version which you can test at your site. When you agree to release the driver version it will be provided officially with our standard download packages (setup and update) at our website and the device will show up in our device directory. Test devices: One device empty without any measurement, one device filled with a few records and one device filled up with maximum memory. If your devices support both blood glucose units, please make sure that the entirely filled device has display unit mmol/l and the second partially filled device has display unit mg/dl. The display unit of the empty device doesn't matter. Test strips: Something about 50-100 test strips to help us performing some additional tests. 1 x Original meter cable. The Windows System driver for your cable for both 32Bit and 64Bit Windows platform. Can be provided by download URL/email. The communication specification which describes how to communicate with your device. Can be provided by download URL/email. A complete fact sheet about the technical meter specifications (can be downloaded here as a pdf file). We would be very pleased to work with you on projects like this. Here you can download this text as PDF for your records.